Surrounding the towns of Camotan and Jocotan, there are around 150 different mountain villages. Only a handful of these villages have an evangelical church. Due to distance and rough roads some of these villages are very hard to travel to and during the rainy season are sometimes impossible to reach. Many people never travel out of their own village and that means there is a need to take Jesus to them. 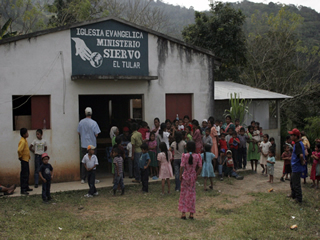 The vision of Servant Ministries is to have an evangelical witness in every village. That's a BIG vision!!! But we serve a BIG God!!! The first step in building a church is to first establish a Christian witness in that particular village. This is done through door-to-door evangelism. When there is an interest shown, a place is found to start a small meeting. After the people have had a time to grow in the Word and in their Christian walk, then a formal church building is planned. 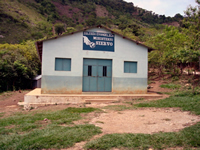 Servant Ministries has to first raise the funds to build and then find the laborers to do the construction. Often times it becomes a cooperative effort between mission teams and nationals to complete the construction. Praise the Lord for His faithfulness to provide all that is needed to bring His presence into these remote villages!